Grover C. Herring, 82, a pioneer resident of South Brevard, 240 Bignonia St., Melbourne, Died Saturday morning at Brevard Hospital. He first came to South Brevard in 1911 and moved here permanently in 1938. Herring was one of the leading contractors in this area after World War II. He built numerous businesses, offices, and homes here. During World War II he was captain of the Eau Gallie Coast Guard Reserve Station. Survivors include his wife Rose B., Melbourne: five brothers Herbert - Kansas City, Mo., Woodson - Craig, Colo., Brent - Detroit, Mich., Norman - Tampa, Bob - Fulton, Mo., and a sister Mrs. Mamie Water, also of Fulton. Funeral Services will be at 10 a.m. Wednesday at the Brownlie Funeral Chapel with the Rev. John A. MacLean officiating. Burial will be in Florida Memorial Gardens. Friends may call at Brownlie Funeral Home Monday and Tuesday from 7 to 9 p.m.
Grover C. Herring, 82, died Saturday at South Brevard Hospital in Melbourne, Fla., where he had been a resident since 1938. He was born Dec. 11, 1884, in Callaway County. Mr. Herring was captain of the Coast Guard Reserve Station in Eau Gallie during World War II. He was a retired building contractor and had been one of the leading contractors in Melbourne, where he had built numerous office, residences and service stations. He is survived by his wife, Mrs. Rose B. Herring, Melbourne, Fla.: five brothers, Herbert Herring, Kansas City, Woodson Herring, Craig, Colo., Brent Herring, Detroit, Mich., Norman Herring, Tampa, Fla., Bob Herring, Fulton; and two sisters, Mrs. Myrtle McCormick, Lakewood, N.J. and Mrs. Mamie Waters, Fulton. Burial will be in Florida Memorial Gardens. Marriage license of Grover C. Herring of Kansas City and Rose Belle Baysinger of Fulton, June 28, 1910, Kansas City, Jackson Co., Missouri. Certificate of marriage, by minister M.W. Barcafer, June 28, 1910, Kansas City, Jackson Co., Missouri. Record of marriage, Grover C. Herring of the county of Jackson and state of Missouri who is over the age of twenty-one years and Rose Belle Baysinger of the county of Callaway and state of Missouri who is over the age of eighteen years. This is to certify that the undersigned a Minister did in said county on the 28th day of June A.D. 1910 unite in Marriage the above named persons. Rev. M.W. Barcafer. 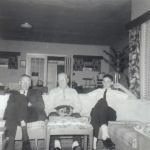 From left; David Herring (my father), Grover Herring (my great uncle), John Herring (my brother), picture taken mid 1960's at Grover's home in Melbourne Florida. Memorial plaque at the cemetery for Grover and Rose Herring. On the 1930 census, living at 827 Walnut St. Flint Michigan. They owned their house, valued at $19,500, they did have a radio. He was a builder, she was a bookkeeper in real estate. Grover was in construction and was instrumental in the building of Melbourne, Florida from the late 1920s. He and Norman lived in Florida until their deaths in the 1970s. I met Uncle Grover and Aunt Rose Herring several times in the early 1960's when we went to visit them in Melbourne Florida. Grover Herring was instrumental in building a large part of the Melbourne area.